Understanding the factors underlying host shifts is a major goal for infectious disease researchers. This effort has been further complicated by the fact that host-parasite interactions are now taking place in a period of unprecedented global climatic warming. We investigated how host shifts are affected by temperature by carrying out experimental infections using an RNA virus across a wide range of related species, at three different temperatures. We find that as temperature increases the most susceptible species become more susceptible, and the least susceptible less so. We found no significant relationship between a species’ susceptibility across temperatures and proxies for thermal optima; critical thermal maximum and minimum or basal metabolic rate. This has important consequences for our understanding of host shift events in a changing climate, and suggests that temperature changes may affect the likelihood of a host shift into certain species. Hosts shifts are more likely to occur between related host species and often rely on the pathogen evolving adaptations that increase their fitness in the novel host. We investigated how viruses evolve in different host species, by experimentally evolving replicate lineages of an RNA virus in 19 different host species that shared a common ancestor 40 million years ago. We then deep sequenced the genomes of these viruses to examine the genetic changes that have occurred in different host species that vary in their relatedness. We found that parallel mutations – that are indicative of selection – were significantly more likely to occur within viral lineages from the same host, and between viruses evolved in closely related species. This suggests that a mutation that may adapt a virus to a given host, may also adapt it to closely related host species. There has been a four-fold increase in the number of known rhabdoviruses from 2010-2015, with rhabdoviruses being found in a diverse array of arthropods. In most cases we know nothing about the biology of these new viruses beyond the host they were isolated from. After using RNA-seq to indentify novel rhabdoviruses in Drosophilidae, we produced a comprehensive phylogeny of the rhabdoviruses. We reconstructed the ancestral and present host associations of viruses to predict which are vector-borne pathogens and which are specific to vertebrates or arthropods. 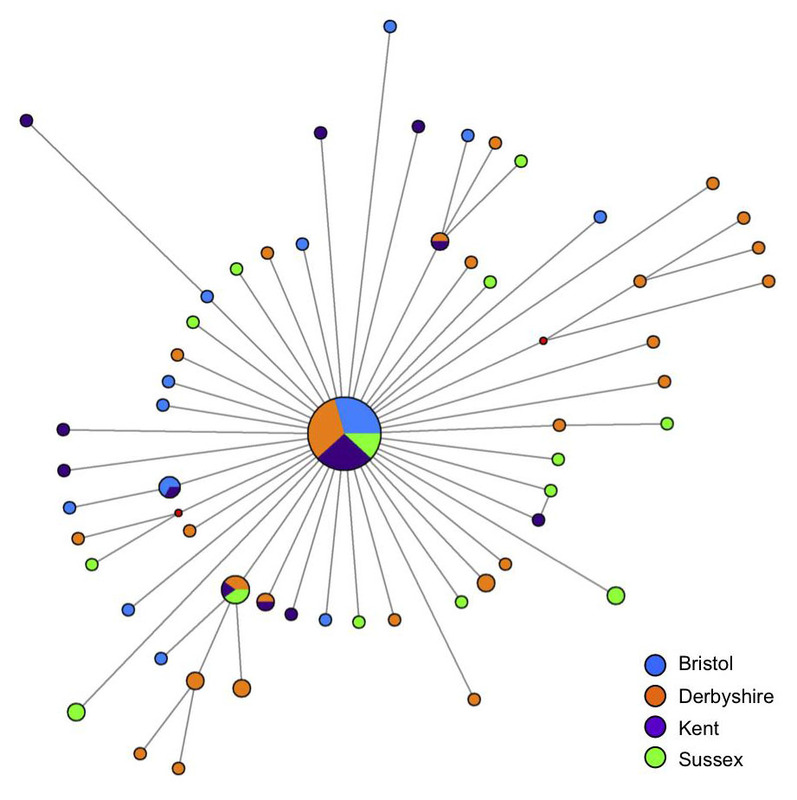 We have found the majority of rhabdoviruses are arthropod vectored vertebrate viruses, but the sigma virus clade and another (as yet unnamed) clade appear to be insect-specific. A striking pattern that emerged from our reconstructions of host use, is that switches between major groups of hosts have occurred rarely during the evolution of the rhabdoviruses. This is perhaps unsurprising, as both rhabdoviruses of vertebrates (rabies virus in bats) and invertebrates (sigma viruses in Drosophilidae) show a declining ability to infect hosts more distantly related to their natural host. Within the major clades, closely related viruses often infect closely related hosts, suggesting that following major transitions between distantly related host taxa, viruses preferentially shift between more closely related species. Virulence — the harm a pathogen does to its host — can be extremely high following a host shift (for example HIV, SARs and Ebola), while other host shifts may go undetected as they cause few symptoms in the new host. To examine how virulence changes following a host shift we carried out an experiment with 48 species of Drosophilidae and Drosophila C virus (DCV) looking at why virulence differs between different host species. We found that host shifts resulted in dramatic variation in virulence, with benign infections in some species and rapid death in others. 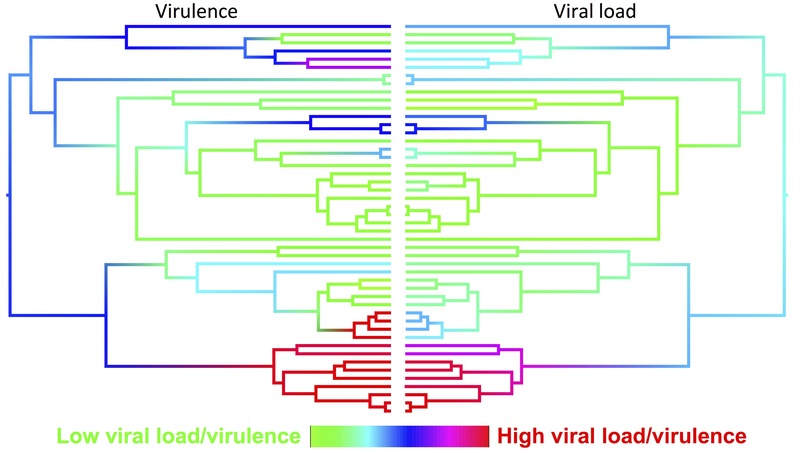 The change in virulence was highly predictable from the host phylogeny, with hosts clustering together in distinct clades displaying high or low virulence. High levels of virulence are associated with high viral loads, and this likely determines the transmission rate of the virus (Figure 5 below). Click here to see a video of virulence changes across the host phylogeny at different time points post infection or read the paper here. 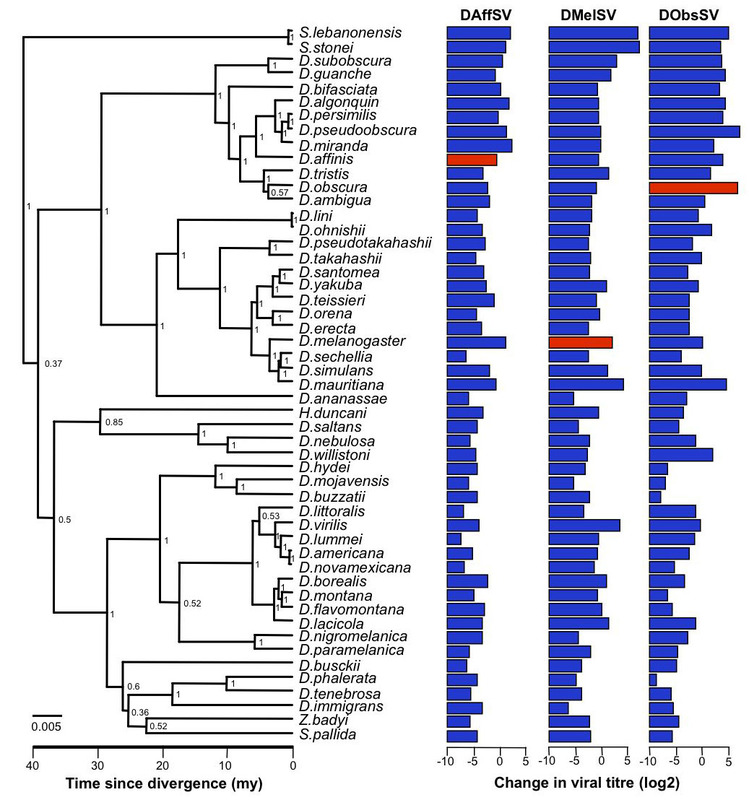 By carrying out a cross-infection experiment with 51 species of Drosophilidae and three sigma viruses (Figure 4) we found that the host phylogeny could explain most of the variation in viral replication and persistence between different host species. This effect is partly driven by viruses reaching a higher titre in those novel hosts most closely related to the original host, suggesting viruses may more readily switch between closely related species. 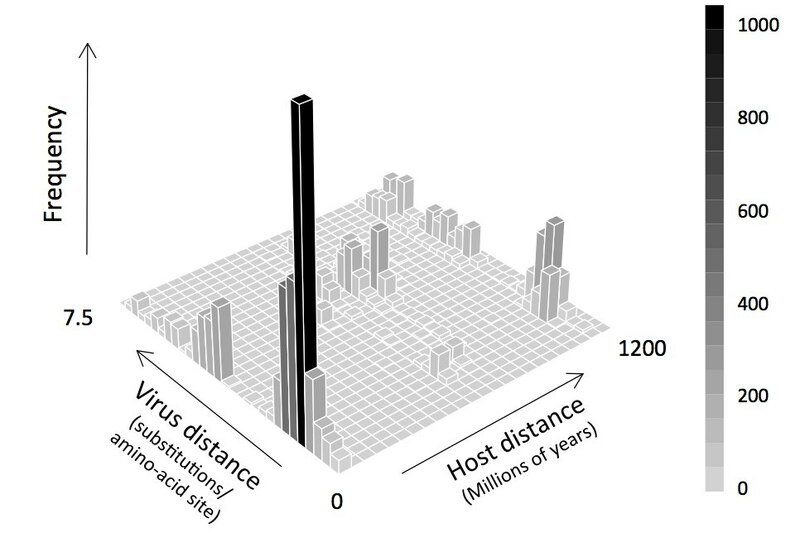 However, there is also a strong effect of host phylogeny that is independent of the effect of distance from the original host, with viral titres being similar in groups of related hosts. We also found some groups of related species that are very susceptible but are distantly related to the natural hosts, which may explain why viruses sometimes jump between distantly related species. Read the paper on this work here. We have found sigma viruses that infect several Drosophila species, Mediterranean fruit flies and a butterfly are all vertically transmitted (see here and here). Unlike bacterial symbionts, sigma viruses are transmitted vertically through both sperm and eggs, so are able to spread through populations despite being costly to infected flies. Four out of the five sigma viruses tested to date have recently spread through their host populations (e.g. Figure 2). This could be due to selective sweeps of an advantageous mutation through an exiting viral population or the spread of new viruses from a different species or population through an uninfected population. It seems that vertically transmitted rhabdoviruses may be common in insects, and they can have very dynamic interactions with their hosts.